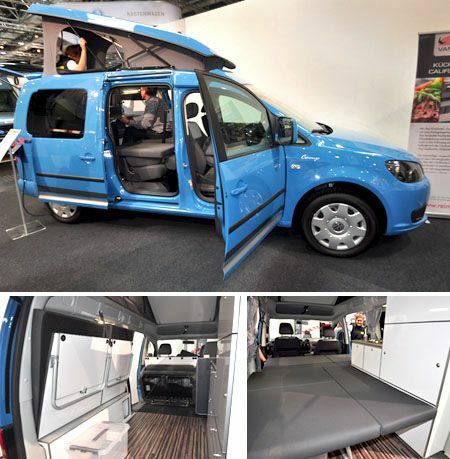 Auto-Sleepers was one of just a few UK manufacturers with a presence in Germany, but it certainly made an impact – thanks mainly to this all-new Mercedes Vito-based camper, called the Wave. It really was hard to miss its outrageous purple paintwork. You’ll also see this vehicle in the UK – in high-top as well as elevating roof variants, and colours starting with white! 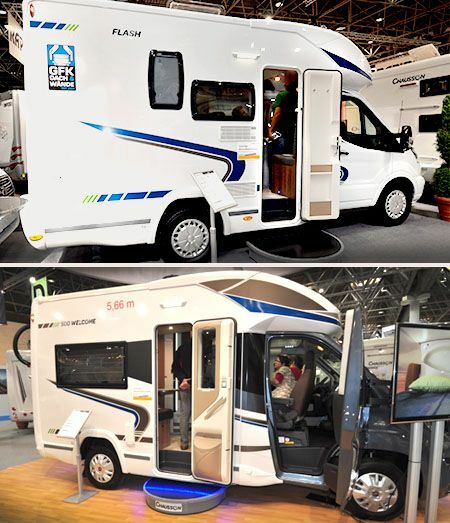 The four-seater floorplan is the same in both variants, with features including a removable compressor fridge and Webasto heating, as well as Auto-Sleeper signatures such as a refillable gas tank. This is the Camp, with elevating roof and some neat interior work that retains the Caddy’s original rear seating for three and twin sliding doors, yet offers a fully flat double bed measuring some 2m x 1.13m. Folding benches can also allow just a single bed, or you can take them out altogether for more luggage carrying space than campers much larger than this can muster. Other neat touches include a coolbox locker and single-burner hob. And yes, it will be coming to the UK. Ford’s latest Transit chassis cab was to the fore on the Chausson stand, the French manufacturer unveiling a full line-up of coachbuilts. Look out for most of these coming to the UK, where prices are expected to start at under £40,000. Each Chausson model will be available as a Flash, or more premium Welcome, underpinned by Ford or Fiat Ducato chassis. The only exception is the overcab C626 family coachbuilt, which will be Ford only. Smallest of them all will be the Welcome 500 – just 5.69m long on the Ford, and 5.66m on the Fiat (shown here) – featuring a drop-down bed over an L-shaped lounge in the rear offside corner, with washroom in the opposite corner. With Hymer well back at the top of the class with its A-class motorhomes, it took things a significant step further with the unveiling of the DuoMobil (based on Hymer’s B Class SL). The German maker enlisted the help of a motorcaravanning couple to help design and building this concept motorhome, including work on its layout and specification – with innovative features such as charging points for electric bikes in the garage, electrically operated open and shut drawers in the kitchen, extra spacious bathroom, and fold down bed that can be set up either as a double or two singles. Not officially for sale (although who knows what might happen in the future? 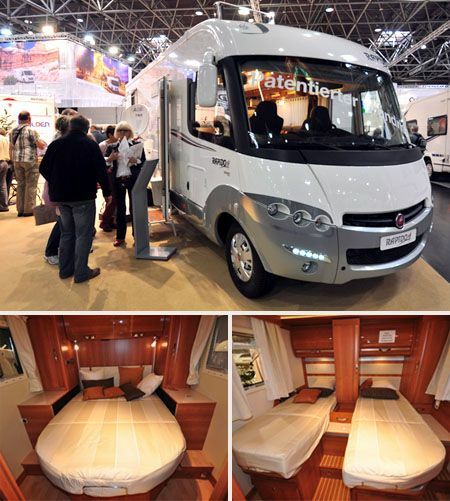 ), you’ll be able to view it for yourselves at October’s Motorhome and Caravan Show at the NEC, Birmingham. Rapido unveiled a number of innovations as well as new models for the year ahead. Among them was this, the 9060dF Mobily. Highlight feature here is its end bedroom, offering a choice of no less than six different sleeping arrangements – with three locations for the double bed and a further three twin single bed settings. It’s all thanks to a clever system of rails for the bed bases as well as the twin wardrobes and roof lockers. The 9060df is expected to be available at UK stockists. 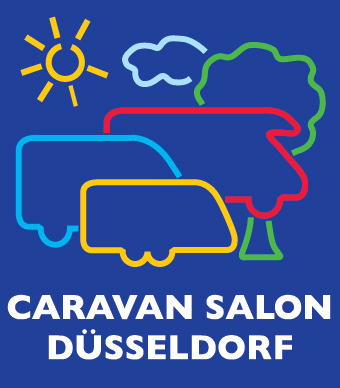 Taking place each year in Dusseldorf, Germany, Caravan Salon is reckoned to be the world’s largest show for motorhomes and caravans. The organiser says 2014’s event was the best-attended in its history, counting some 192,000 visitors – some 60,000 of these stayed on site overnight in their own vehicles. 580 exhibitors from 25 different countries were also in attendance. 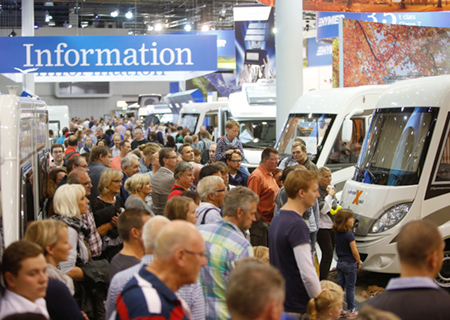 How does it compare with the UK’s Motorhome and Caravan Show? We thought the NEC shows were big, but Dusseldorf is something else. 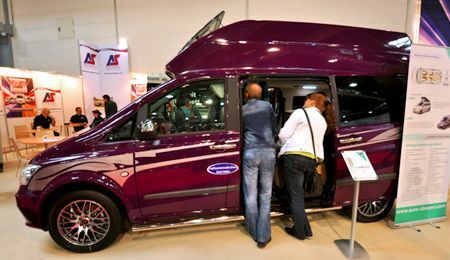 Just to compare, in October 2013, the Motorhome and Caravan Show at Birmingham’s NEC Arena attracted over 100,000 visitors. This year’s October NEC show is set to have over 400 exhibitors on display in one of 11 huge halls. 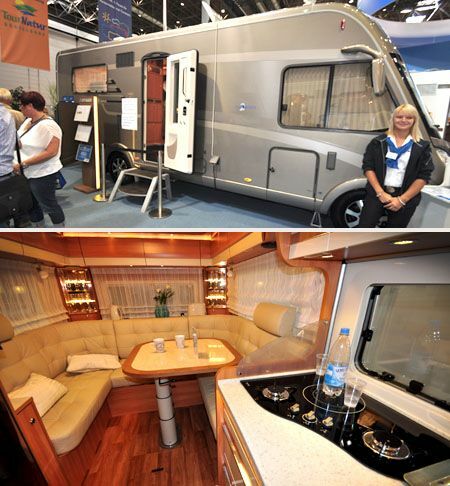 like the look of the Hymer concept m/home about time they asked motorhomers what they want. We agree Mr Jarvis – it’s a great way to approach motorhome design!